I was getting a bit depressed with all the devastation and demolition of the last few posts, so I went searching for structures that have survived: not too difficult a task in my neighborhood. The weather is odd here (for January): quite warm, foggy, air filled with moisture but no rain or snow. Rather dreary, really, as you can tell from the photographs. On dark days like these in the midwinter the built landscape really stands out, with no natural landscape to frame or cloak it. 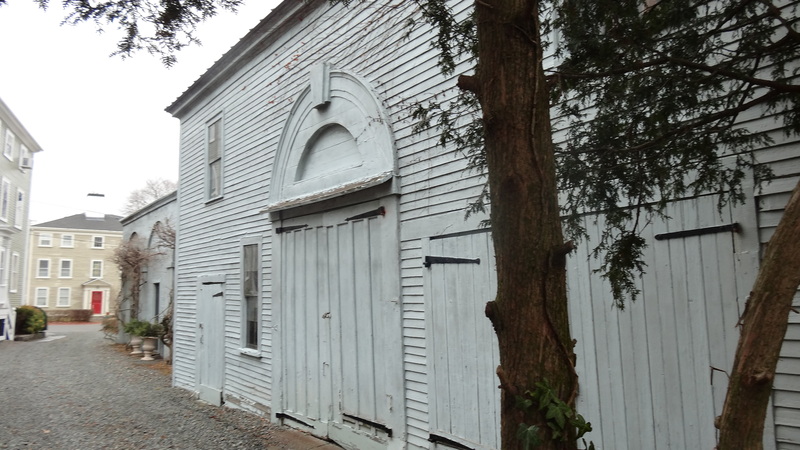 For some reason, on my walk yesterday I was particularly noticing the outbuildings rather than the facades: Salem has many great carriage houses, most in pretty good condition. This is impressive to me: it’s hard enough to preserve a big old house, but keeping an ancient ancillary building in good shape is a true commitment. 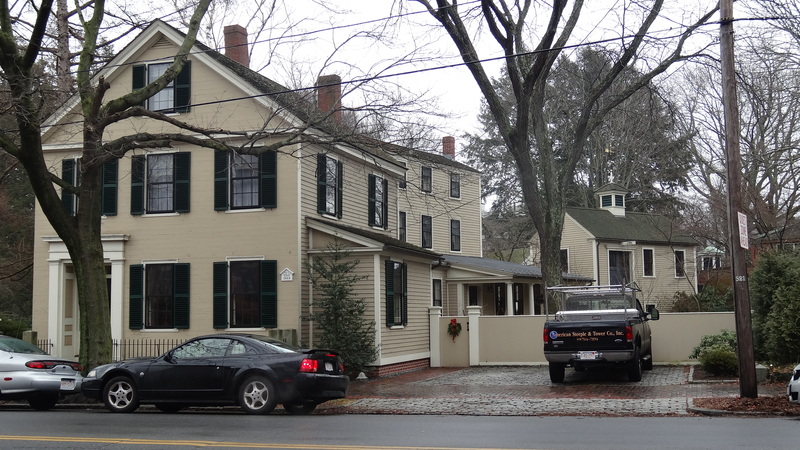 We lost our carriage house long ago: it is evident on the late nineteenth-century street atlases of Salem, but after the turn of the century, it’s gone. 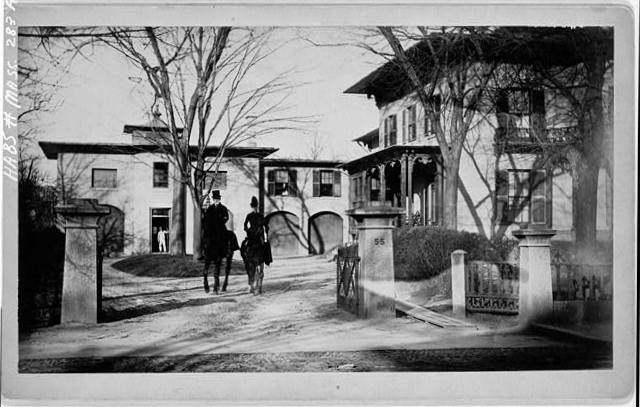 I don’t have anything similar for Salem, so I want to start with an image of the Valentine-Fuller house in Cambridge, Massachusetts: Mr. and Mrs. Fuller are on horseback in their carriage-house courtyard, circa 1890: this seems like the peak time for carriage houses to me. After that, they would either come down or be preserved as storage structures or garages. This house, which was built in 1848 on Prospect Street, was demolished in 1937, along with its outbuildings (oh no, more demolition). 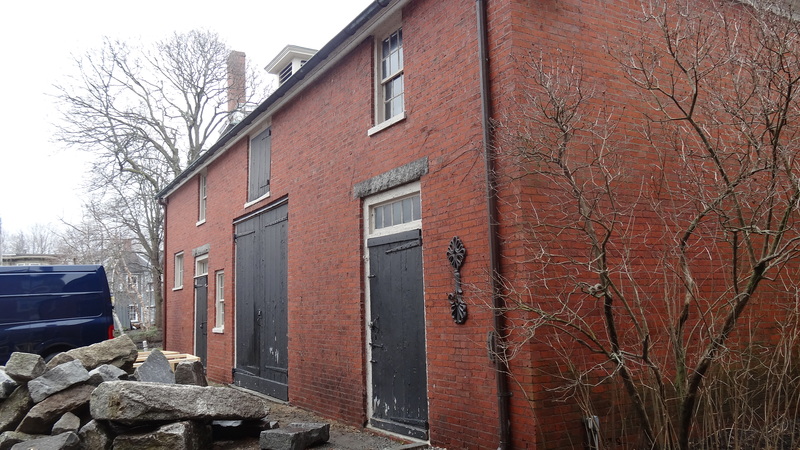 Back in Salem, carriage houses can be found in several neighborhoods, so this is just a sampler, or part one. On the street where I live, Chestnut Street, there are some amazing carriage houses, several of which are laid out a considerable distance from their main houses so you really don’t get the courtyard effect that you see above. On one side of the street, a completely new parallel street, Warren Street, was laid out as an access route to these buildings. 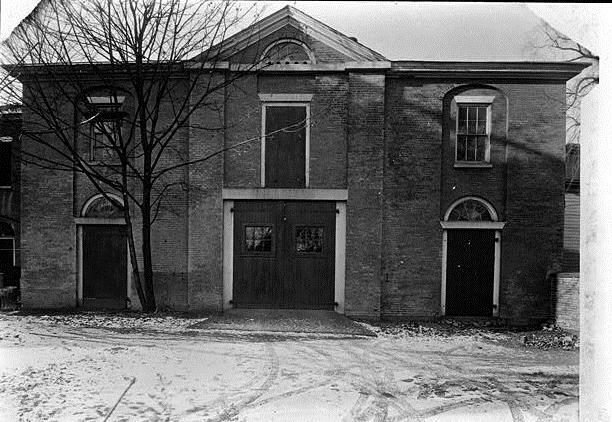 The photographs below are all of Warren Street carriage houses that belong to mansions on Chestnut, but two of them appear quite capable of fulfilling an independent existence. 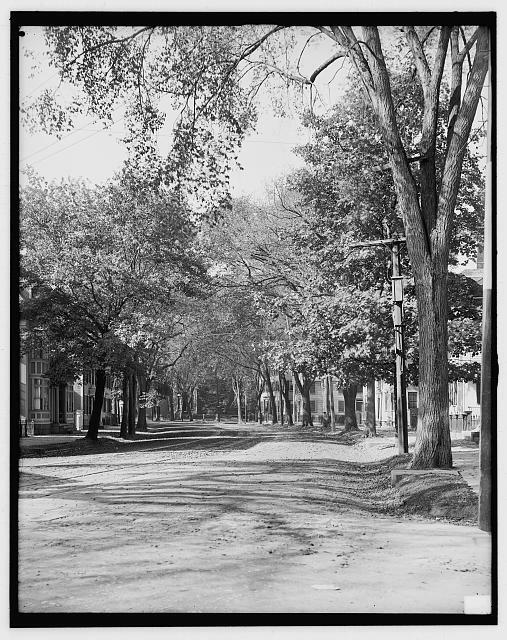 Essex Street, which was the colonial (and remains the present) main street of Salem, runs parallel to Chestnut on the other side: because of its early settlement, it features many beautiful carriage houses–primarily wooden rather than brick. In the general vicinity of the Salem Public Library, stalwart structures peak out from behind the streetscape, particularly visible at this time of year. 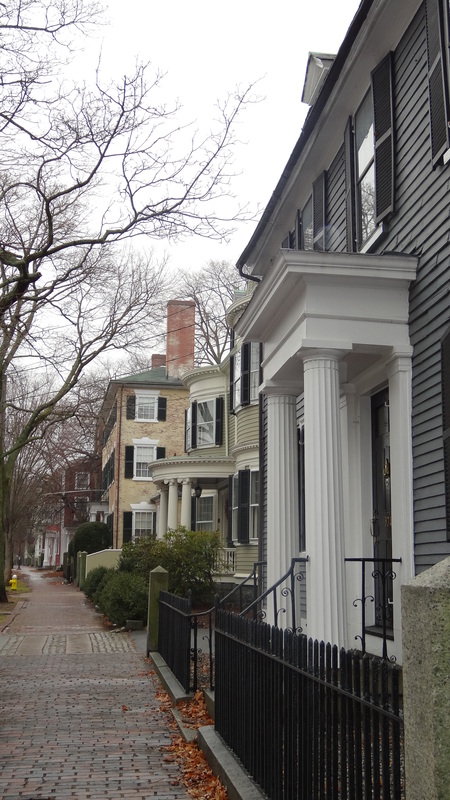 Behind this trio of houses–Georgian, Colonial Revival built on the site of a pulled-down Federal at the turn of the century, and Federal–are some of my favorite carriage houses on the street and in Salem. 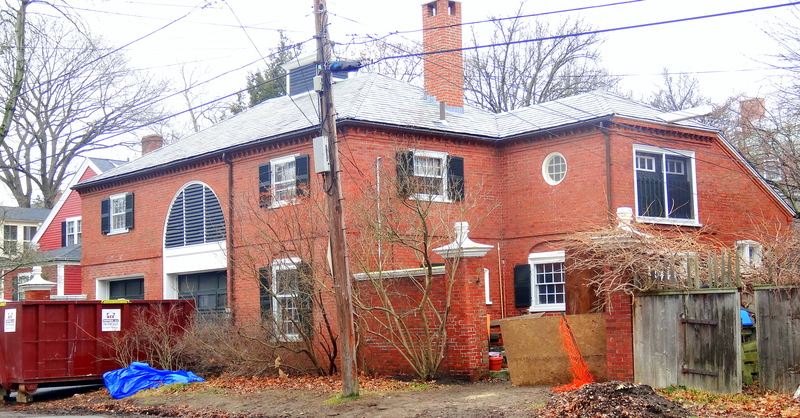 And then just across the street from the library, there’s this wonderfully restored Greek Revival, with its NEW carriage house aligned perfectly with what I assume are later nineteenth-century additions, creating a nice sense of enclosure for its yard. 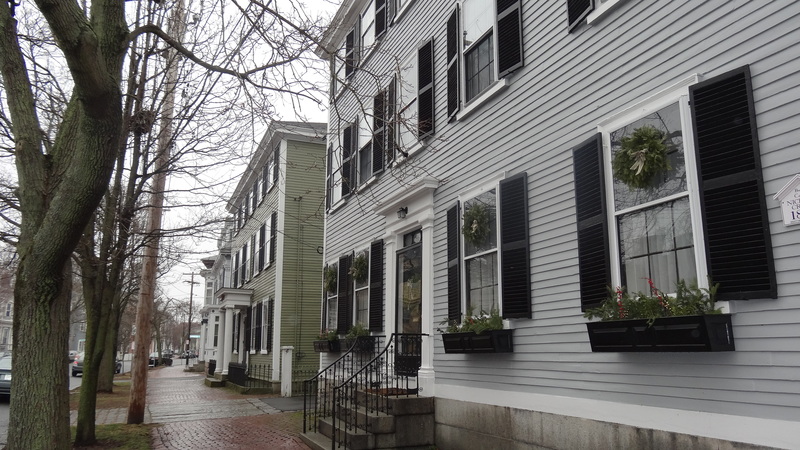 Just a little down the street, is a (nearly) matched pair of Federal houses dating from about 1800, both of which have great carriage houses. 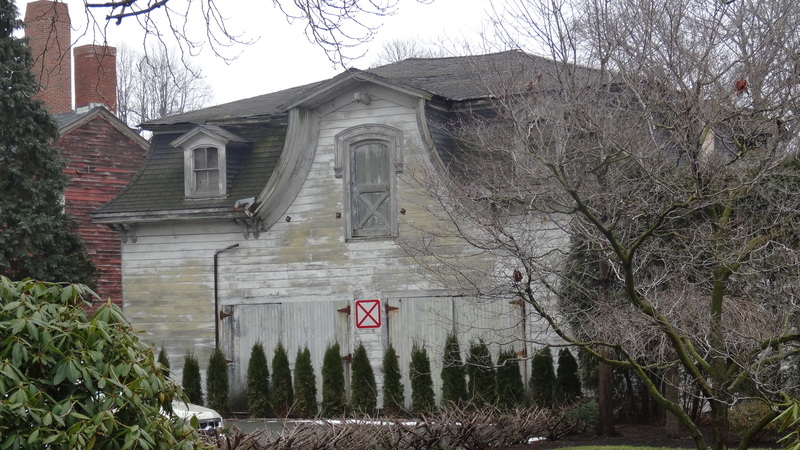 As you can see, carriage-house cupolas abound on Essex Street! 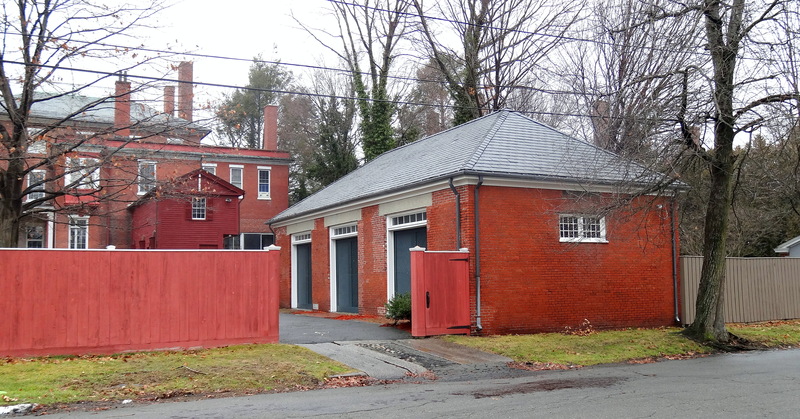 On my way across town to the Common, I stopped to take a photograph of a very controversial Federal Street carriage house. It appears to belong to the very stately Victorian that was converted into condominiums a few decades ago, but actually is part of an adjacent property whose owner tried to do the very same thing with his carriage house at the same time (this was all before I came to Salem, so I’m not that clear on the details). When he did not get approval, he moved out of his Federal Court house and let it and the carriage house rot. So this is the result, 20+ years later. 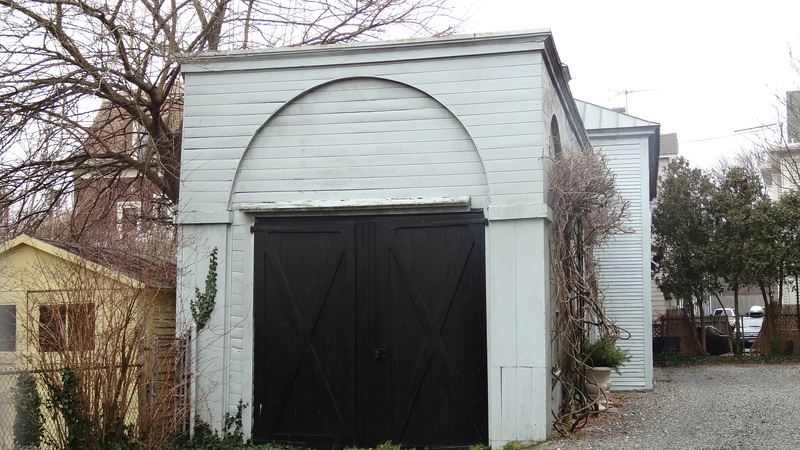 As this is the birthday week of Salem’s famed architect Samuel McIntire, I’ve got to feature some McIntire carriage houses which, again, is not difficult to do. 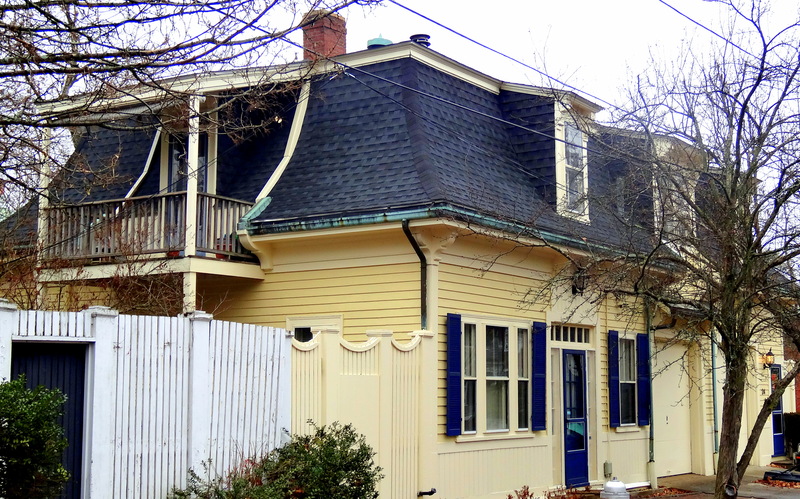 Everybody’s favorite McIntire house, the Gardner-Pingree house, has a charming carriage house in back which has a slightly smaller stature, in keeping with the general scale of the house. 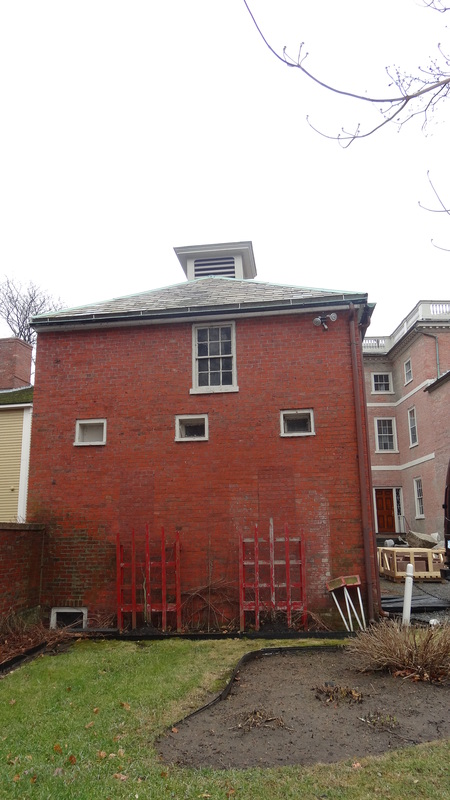 There’s a restoration project going on there now, so I’m sorry that the pictures give a work-site impression, but you can still see how great this outbuilding is. 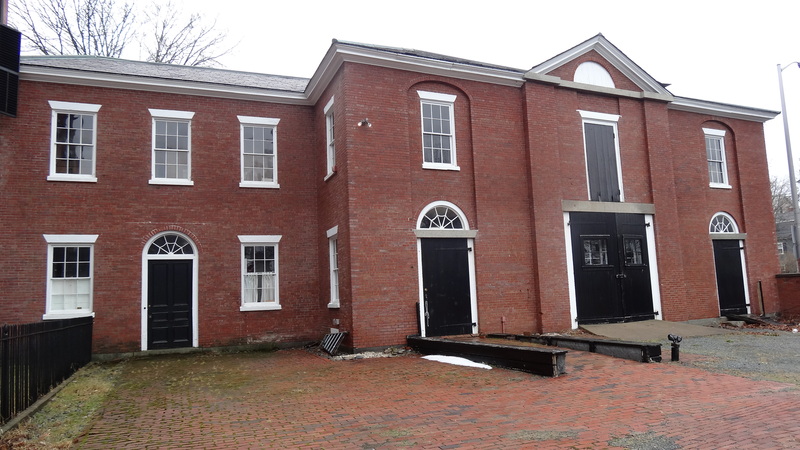 Just next door, another house owned by the Peabody Essex Museum features one of the most prominent carriage houses in town: the Andrew Safford House was built after McIntire’s in 1811, but you can see his influence in both the main house and the carriage house, both of which overlook Salem Common. When it was built in 1819, this was one of the most expensive houses in America, and it remains very impressive, nearly two centuries later. 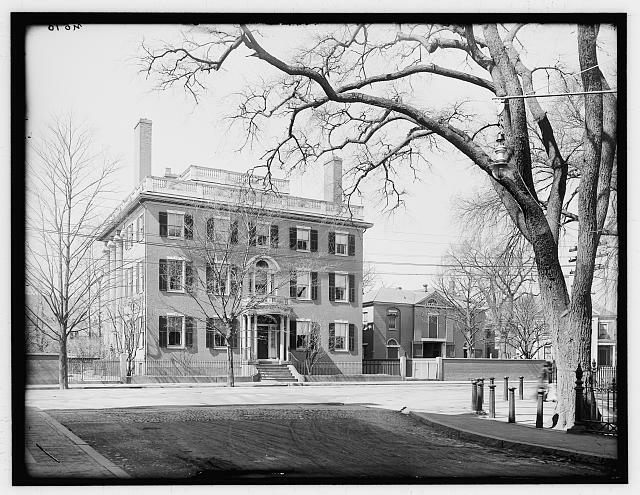 The Andrew Safford House and Carriage House, yesterday and in 1910 & 1939 photographs, Library of Congress. 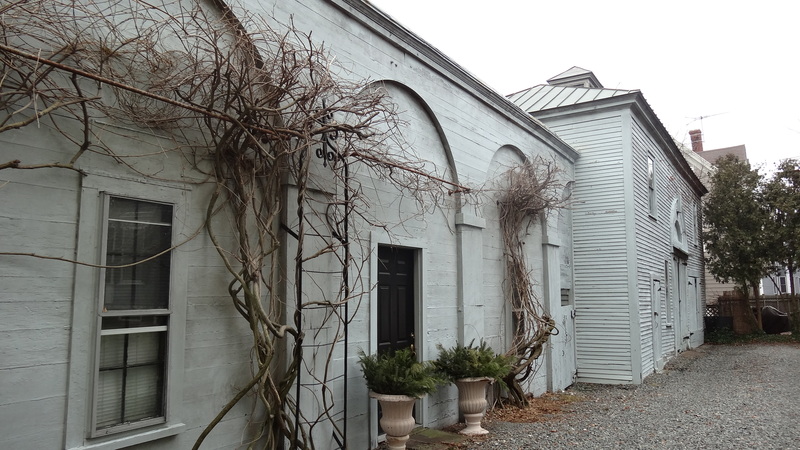 Finally, my very favorite Salem carriage house. 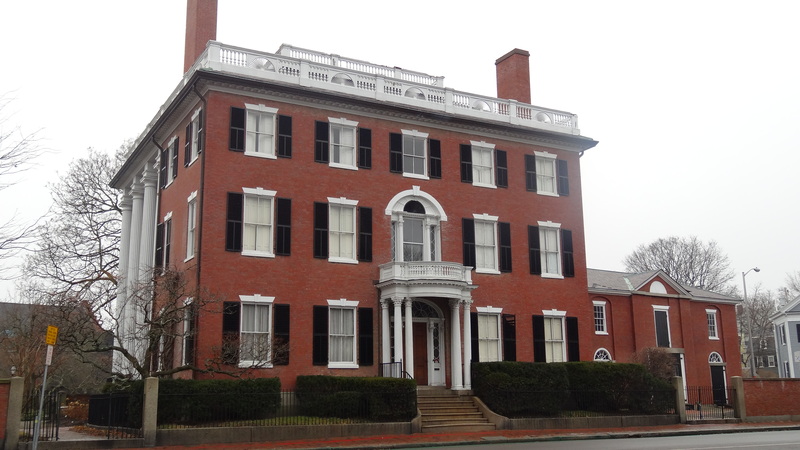 The Clifford Crowninshield House (1806) is a McIntire house located on another corner of the Salem Common, just across from the Safford house. 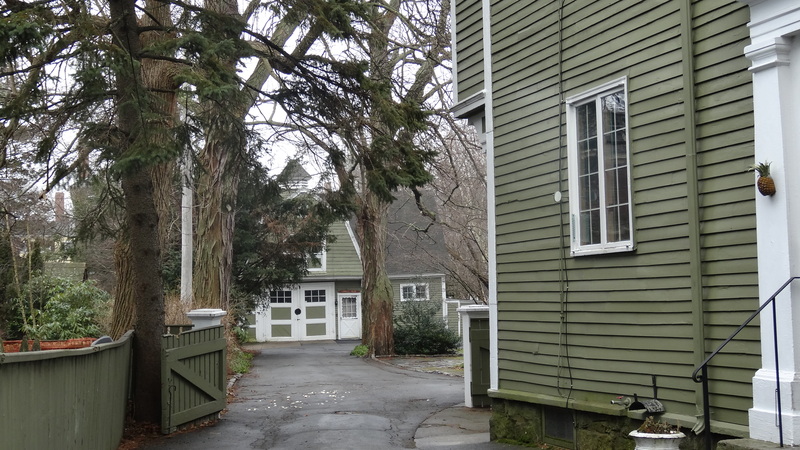 Behind the main house, almost hidden really, is a wooden carriage house with an elegant stature and very intricate details: every time I pass by it makes me smile.